The PCRmax Eco 48 utilises patented block and optical technologies to deliver extreme speed, sensitivity and data quality, with optimised protocol as fast as 15 minutes, all using standard plasticware and consumables. With sensitivity of detection down to 1 copy and the worlds most accurate block the Eco 48 will deliver Speed. Confidence. Performance. Value and Sensitivity. 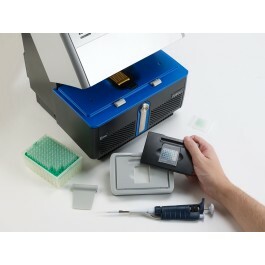 The PCRmax Eco 48 real time PCR system is a high specification, economically priced real time thermal cycler that accommodates a unique 48-well polypropylene PCR plate utilising the same geometry as standard 384-well plates, but only 1/8 of the size. This enables users to dramatically reduce the qPCR reagent volumes compared to traditional 96-well instruments, whilst still producing a strong fluorescence signal. Minimizing the plate size also significantly improves thermal uniformity. A minimum volume of 5μl is validated, cutting reagent costs in half and making more efficient use of expensive and hard to acquire template DNA samples. MIQE compliant open licence software giving confidence when it comes to publishing your data. HRM functionality as standard: with the ability to discriminate class IV SNP >99% of the time. Eco 48 allows for simple multiplex analysis with up to four dyes at once. World most thermally accurate block gives consistent data every time. High uniformity provides high quality data. Fast cycling enables several experiments per day, all at an economical price. Fastest block-based real-time PCR system. 40 cycles in 40 minutes standardly and 40 cycles in as little as 15 minutes after optimisation of temperatures and hold times. Eco 48 is an open platform that can utilise any chemistry, dye or PCR reagent. Easy to use software, making analysis simple and fast. 1. Load samples into the 48-well plate using the backlit Eco Dock and place the plate into the Eco 48. 3. The Eco 48 software provides instrument control, data collection, and data analysis. The most common qPCR parameters are automatically in place. These can be easily changed on the computer to meet specific experimental requirements.